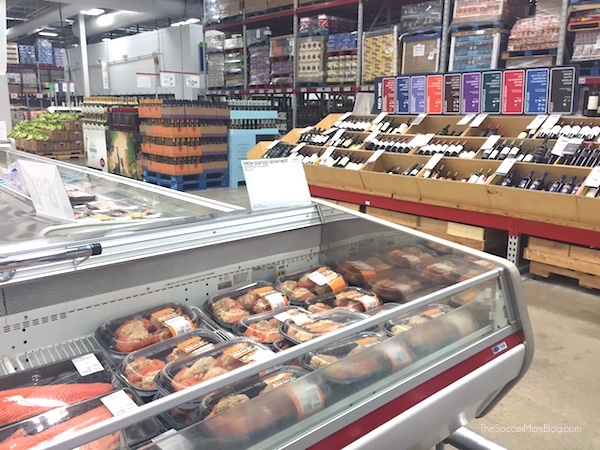 Salmon is our family’s favorite protein — in fact, we enjoy it every week on what we’ve dubbed “Salmon Mondays.” We have a few go-to dishes, but were thrilled to partner with Sam’s Club to create a new salmon recipe. Salmon is Healthy Living Made Simple magazine’s superfood of the month for March and April and broccoli is the superfood of the month for January and February, so we incorporated both! 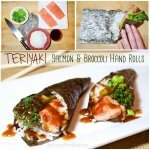 My husband is the creative mind behind most of the recipes on the blog, and when I told him the two ingredients for our recipe, it only took him about 30 seconds to toss out the idea for Teriyaki Salmon Hand Rolls. Seriously, where does he come up with this stuff so quickly? Genius! Interestingly, it was I who turned out to be the better sushi-maker! So, if like me you are not a whiz in the kitchen, rest assured that you CAN make this recipe, and it will be beautiful! (And of course, delicious!) This recipe is perfect for Lent or year-round as a healthy seafood option. Mix 1/4 cup soy sauce, 5 tsp brown sugar, 1 TB honey, 1/4 tsp ginger, 1/2 tsp garlic, and 1 cup water (or pineapple juice) in a small saucepan over medium heat. While sauce is heating, combine corn starch and 1/3 cup water in small bowl until corn starch is fully dissolved. Add cornstarch/water mixture to the teriyaki sauce in pan and continue heating until sauce starts to thicken. Remove from heat and set aside. Cut salmon into filets for easier cooking. Pour 1/4 cup soy sauce in a small bowl. 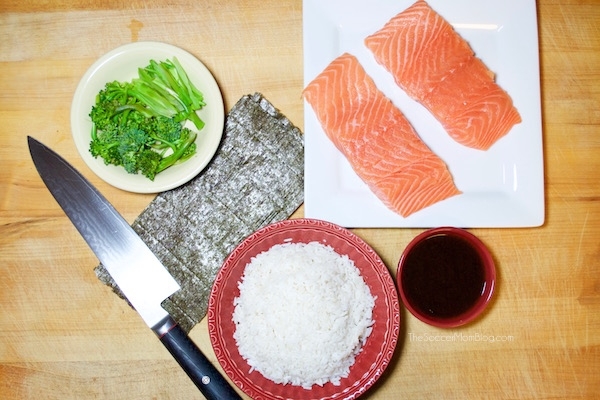 Dip each salmon filet in soy sauce and turn to coat. 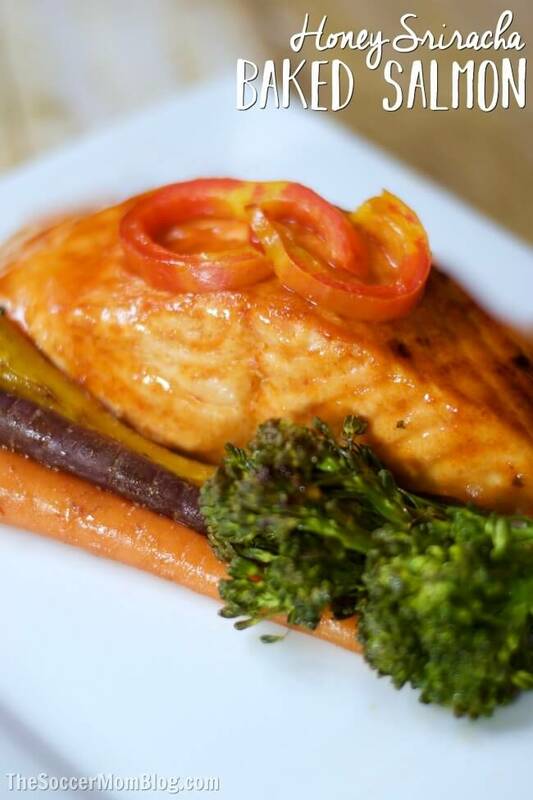 Cook salmon with your preferred method or follow the steps in our post How to Cook Perfect Salmon. This method is about as foolproof as it gets! Cut cooked salmon into strips about 1/2 inch wide. Steam broccoli for 2-3 minutes until al dente. Slice florets and stems into thin strips (no more than 1/4 inch wide). Prepare 2 cups rice according to directions on package. We use a countertop rice maker. When rice has finished cooking, you may use as-is, or you can stir in a bit of traditional sushi rice flavor (1 TB rice vinegar, 1 tsp sugar, 1 tsp salt). 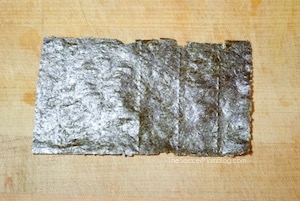 STEP ONE: Cut nori sheets in half lengthwise and cut 1″ from each end. Lay one piece of nori on your workspace with smooth side facing down. Dip your fingers in a small bowl of water to keep rice from sticking to your hands. Gather a handful of sushi rice and cover one half of your nori sheet about 1/3 inch thick, leaving a small margin of seaweed with no rice along the edge. STEP TWO: Lay one strip of salmon and a few strips of broccoli diagonally across the top of the rice, pointing towards the top right corner of the sheet. Gently roll the bottom right corner of the nori diagonally towards the top of the sheet, turning slightly as you go to form a cone shape. Once you’ve made it all the way around to create a cone, trim excess nori with kitchen shears. Dip fingers in your bowl of water and run along the edge of the nori that you just cut until well-dampened. Press onto the cone to seal. STEP THREE: Place your hand roll onto a plate, sealed side facing down. Drizzle with your teriyaki sauce and serve with extra sauce on the side for dipping. A little extra incentive to try out a fabulous new salmon recipe: the Omega-3s found in salmon have been shown to prevent heart disease and stroke! What else makes salmon so awesome? Check out Healthy Living Made Simple magazine online to find out many other reasons that broccoli and salmon have earned the title of “Superfood” as well as more inspiration for living your best life! 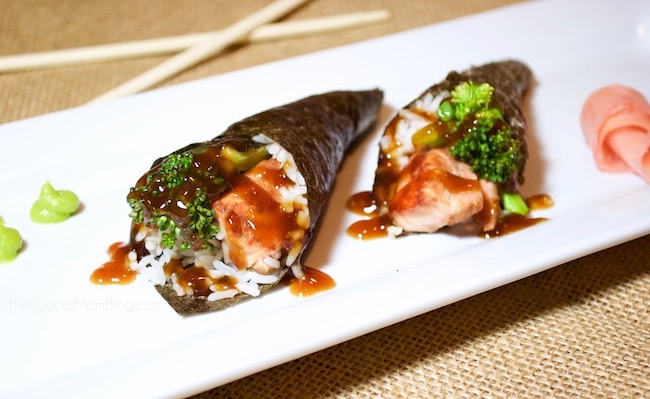 Packed full of flavor Teriyaki Salmon Hand Rolls are surprisingly easy to make at home! Mix 1/4 cup soy sauce, 5 tsp brown sugar, 1 TB honey, 1/4 tsp ginger, 1/2 tsp garlic, and 1 cup water (or pineapple juice) in a small saucepan over medium heat. While sauce is heating, combine corn starch and 1/3 cup water in small bowl until corn starch is fully dissolved. Add to the sauce in pan and continue heating until sauce starts to thicken. Remove from heat and set aside. Follow the steps in our post How to Cook Perfect Salmon. This method is about as foolproof as it gets! Prepare 2 cups rice according to directions on package. We use a countertop rice maker. When rice has finished cooking, you may use as-is, or you can add a bit of traditional sushi rice flavor (1 TB rice vinegar, 1 tsp sugar, 1 tsp salt). 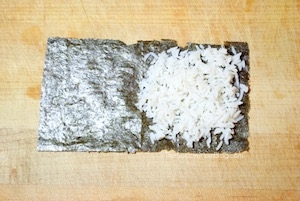 Cut nori sheets in half lengthwise and cut 1" from each end. 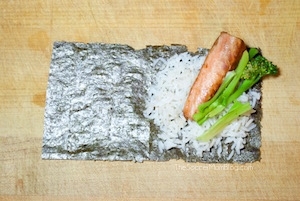 Lay one piece of nori on your workspace with smooth side facing down. Dip your fingers in a small bowl of water to keep rice from sticking to your hands. 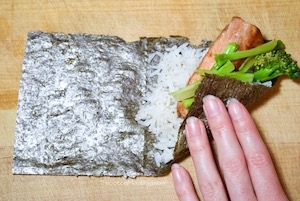 Gather a handful of sushi rice and cover one half of your nori sheet about 1/3 inch thick, leaving a small margin of seaweed with no rice along the edge. Lay one strip of salmon and a few strips of broccoli diagonally on top of the rice, pointing towards the top right corner of the sheet. Gently roll the bottom right corner of the nori diagonally towards the top of the sheet, turning slightly as you go to form a cone shape. Once you've made it all the way around to create a cone, trim excess nori with kitchen shears. Dip fingers in your bowl of water and run along the edge of the nori that you just cut until well-dampened. Press onto the cone to seal. 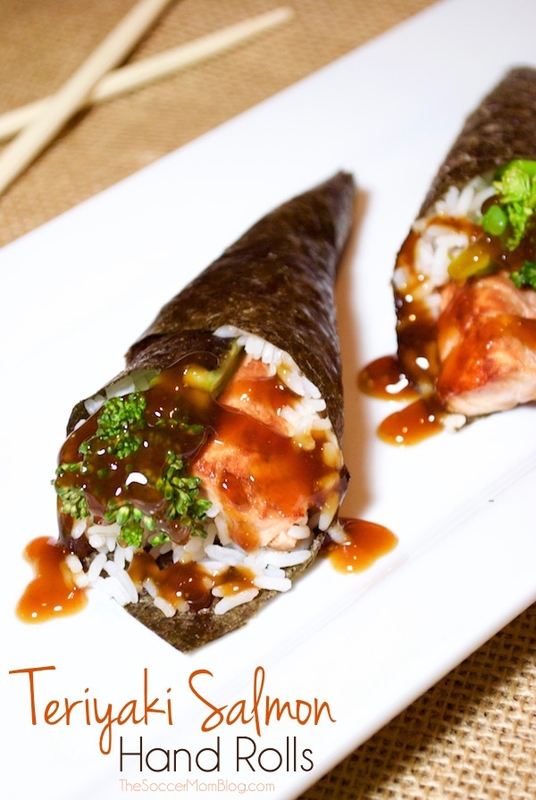 Place your hand roll onto a plate, sealed side facing down. Drizzle with your teriyaki sauce and serve with extra sauce on the side for dipping.